Captured Planetesimals" a narrow portion of the asteroid belt stretches' across this hypothetical view of space. Closer to our vanish point are Mars and its two moons. Could this tiny Deimos and Phobos be asteroids yanked into orbit around around Mars? 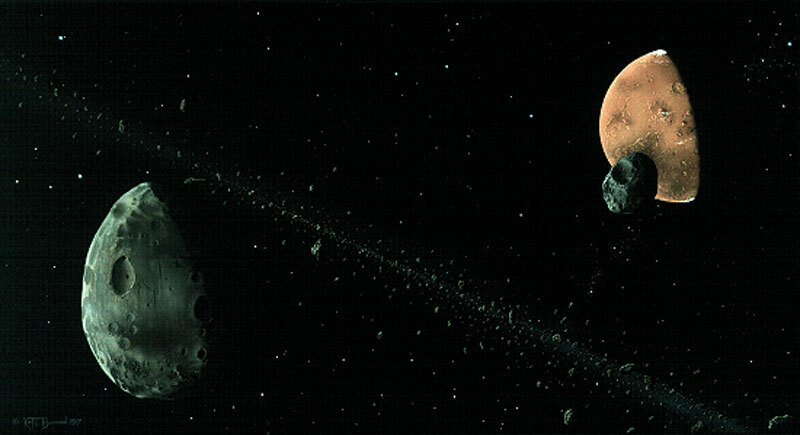 "Captured Planetesimals" is a impractical view of both planetesimals Phobos and Deimos looming in the same visual scope of Mars, together with the asteroid belt.